This project was commissioned by the National Pastime Museum. 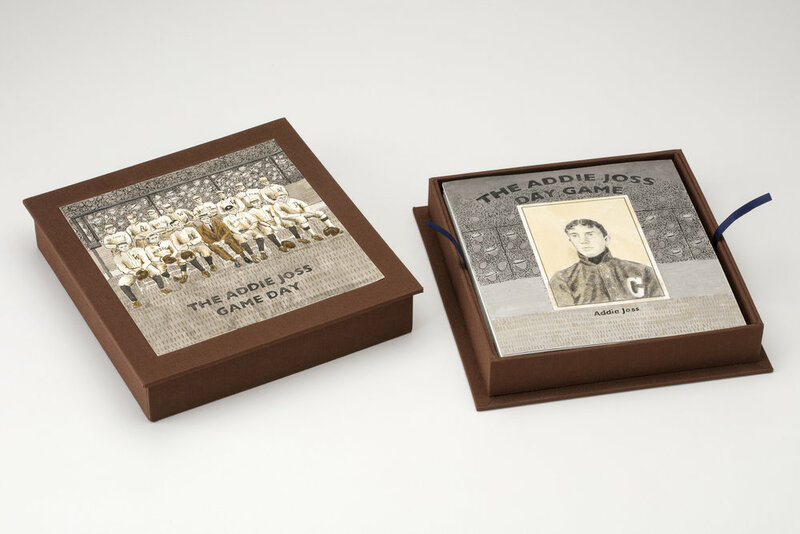 My task was to create a set of baseball cards to commemorate the Addie Joss Benefit Game in 1911 which was a precursor to baseball's annual All Star Game. The ink drawn image above is based on a panoramic photo of the Cleveland Naps and All Star players on the field before the game. The box holds a set of 28 ink and graphite baseball cards of the players who took the field that day. I loved doing the research for this! The box was created for me by James Reid-Cunningham of Cambridge, MA. A four page accordion book of paintings directly on vintage postcards and photos found at various flea markets. There are 22 c. gold leaf details. Bound together with wire and ribbon, with painted cancellation marks and postage stamps on the back of the postcards. It measures 5.5” high and unfolds to 12. A unique accordion book filled with paper mosaics that are details from the Apocalypse mosaic at San Marco in Venice (dated 1570). The book’s structure is made from mahogany, and bound with cloth and nails. The mosaics are tiny pieces of paper glued into place, then painted and gilded. The cover is a mosaic of the title. It measures 3” high by 11 ½” wide when opened. This book is about going through the stages of an experience that turned my world upside down: a year of treatment for breast cancer. It was made at a time when I was trying to move from a place of fragility to one of strength and confidence. The two lantern slides in the center of the book show frescoes from the Arena Chapel in Padua, painted by Giotto in a cycle about virtues and vices. I used his titles anger and hope. The first and last pages hold vintage postcards depicting sculptures of women. I called the first melancholy- she is fragmented, but still stands tall. The last page is peace- a woman at peace with herself. This unique book object is housed in a mahogany box with a painted lid which holds a brass key made from clock parts. The hinge is made of silver. Inside, the box is lined with painted paper, and holds volvelles with words, which when turned, create poetry about hope. Thus unique book object is housed in mahogany box. The cover holds a brass clock part. Inside there is a small painting illuminated by watch parts and other odds and ends. The small prudella is a nod to Sienese landscape paintings. The facing page holds volvelles with words, which when interacted with, produce poetry about time.